I’m not sure what I’m waiting for exactly. A huge stretch of free time on a weekend afternoon? Hah. Not being exhausted one evening and blog away the night? When I am still awake after 10 p.m., I’m doing a whole laundry list of other things, usually household-related. A pocket of free time at work? Not a chance. At this point, I have been back for over a month and the Big Thing (an event at work) has passed so I’ve just got to post this! With an end-of-the-week departure date on a Friday, I had NPY haul the suitcases out of storage earlier in the week and packed into the early morning hours of Friday. I had precious little sleep and only that evening realized how frightfully early we were waking E to get to the airport even if the departure time was at a reasonable sounding 9 a.m.
That stroller I delighted in getting a little over a year ago? Not actually used that much either locally or on the two trips across Canada since. The kid is over three years old this time and I’d rather he’s walking when not on an airplane and I’ll be more mobile even if he has a carry-on suitcase than if I have a stroller. It’s not even like the weather and sidewalk conditions wouldn’t be amenable to using a stroller (like in the winter) but I still did not bring a stroller. Can we talk for a minute about the Westjet boarding passes? I don’t know how long it’s been in its current format but it’s adorable. 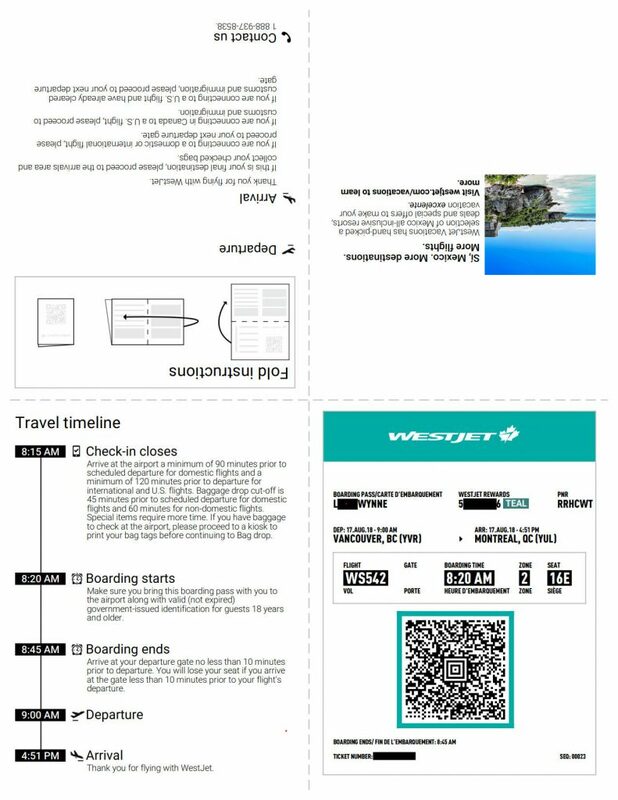 With instructions on folding the printout creating a passport-sized brochure, it is funky boarding pass on one side and a personalized timeline for your travel on the other. 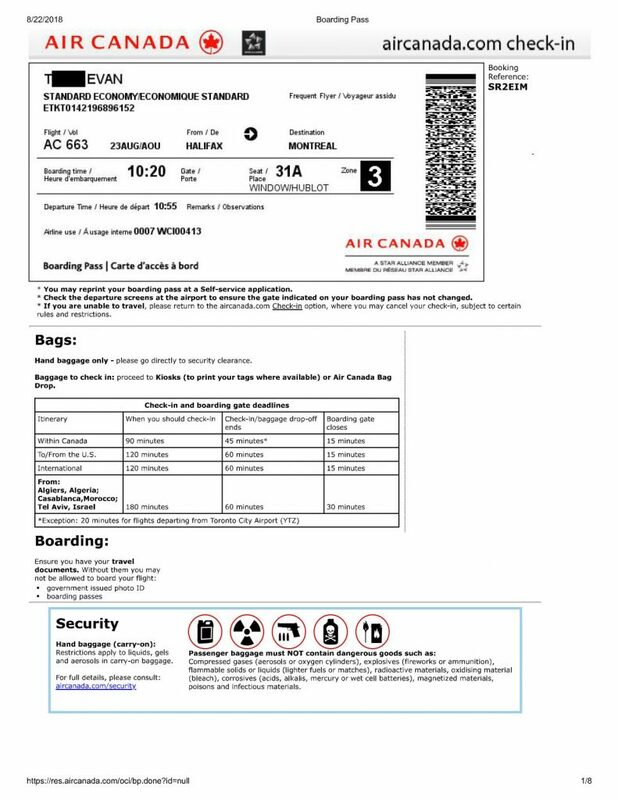 Meanwhile, Air Canada’s boarding pass appears the way it always has, a digital copy of the one you’d be issue on paper. Yawn. But most importantly for the way I currently travel (i.e., checking a car seat) was the difference between the Westjet and Air Canada online check-in system’s ability to process that I have one paid checked piece of baggage and one free checked item that is the kid’s car seat. Westjet handles it but Air Canada doesn’t. At the airport, I can print out my Westjet baggage tags at the kiosk and proceed to drop off my bags. Air Canada online check-in will process my paid checked baggage but doesn’t process the kid’s car seat – because it doesn’t know how to not charge for checked items!! – so I couldn’t go to a kiosk else it would only print one baggage tag when I need two. To the miles-long Check-In Assistance queue I go straight. An SMS alert notified us as we prepared to leave that there was a 30 minute delay and that gave us breathing room and the kid could be woken up about 20 minutes later. It did mean that NPY would get to work 30 minutes later. In the bag drop line, I had a unique fiasco with a fellow traveler. I could tell she was impatient whenever the line moved ahead and I was a few second delayed in pushing my laden airport cart ahead. With just a suitcase to roll, she crept up beside us as if trying to overtake us, not content to queue properly behind me. Once, I was stuffing something back in my suitcase when the line moved and I was a few more seconds slower and she jumped ahead of me. I can’t remember my particular words now but there may have been a whiny edge and I was clearly audible, asking what she was doing. She justified that she could go ahead because I was slow; further, she was very late for her flight. I protested that’s just not how we queue here. I had to bite my tongue before sounding like a racist and likening her to some ethnicity associated with bad/non-existent queuing manners. Afterall, we were audible to all the people in the queue around us. I would have given her the spot if she had asked. In Chinese, I described to the kid what just happened – it was my way to vent. Five or so minutes later, where I carefully avoided her gaze as to not accidentally look angered, she kindly offered my spot back to me. I magnanimously waved off the offer. I don’t need the spot – I’m not running late. Touché. Despite being roused early from his sleep, E was thrilled to be at an airport after prepping him for the adventure for over a week. He was in new surroundings and had his own suitcase to pull (carrying his toys and snacks). With the first of four $10 Air Canada meal vouchers I got last December, I picked up water, smoothie and a pastry from Starbucks. Unfortunately, the jet we were on for the big chunk of our day-long cross-country journey felt like a dive. I was armed this time with VIM anti-bacterial wipes with a strong lemon scent and the kid asked, “乜嘢味道?” It’s the smell of trying to keep you healthy, kid. It really felt like I should have expended two wipes but where do I stop? I knew I had taken care of the brunt of it but get this: There was fruit juice spatter on the window sill, dried food behind the tray, coffee stains on the safety card the kid wanted to read. I learned later the evening (reading the inflight travel magazine) that cabin crew groom the plane during the day between flights and cleaners come in once a day. No wonder so much stuff was missed. Naturally, the kid needed a diaper change and I was chagrined that he wasn’t sufficiently diaper-trained. This time around, he’s too long for the puny change table to it was a standing operation. Then I needed to use the washroom and it was an acrobatic challenge of using the washroom myself while he stood against the door. “Don’t touch anything!” I was wiping him down constantly and rolling on Immune (Saje) for a couple days. It’s not germ season but it’s a good practice. I was feeling bored within half an hour but resisted busting out his toys on account of how gross I felt the aircraft was and his toys ROLL. I was bored. He was largely okay. He wouldn’t sleep and I struggled a bit trying and eventually took it into stride. On landing, I learned the next flight was delayed 55 minutes. We lined up at Tim’s and the queue was not moving. After what felt like 20 minutes, we left the line because he was looking tired and I thought I could find a quiet place (hah!) and turn him away from the chaos and he would sleep. Hah – after leaving the boring line, he perked up again walking around. Our next flight was delayed another 20 minutes so I did have plenty of time to queue for Tim Hortons – it seems like a myth of actually getting food there, recalling I’ve given up on that queue twice now. He head to the small jet end of the terminal, accessible via a long pathway under the tarmac. I was reluctant to go anywhere. I heard on the PA system that some flight to Halifax and then on to CDG and Glasgow was cancelled but the agent didn’t mention flight number. I figured it couldn’t be mine since I knew our jet was a tiny one, too tiny to go across the ocean. I wondered at the cause of the cancellation. The agent came on again to announce gate change, also not mentioning flight but I figured it out that it was our flight and we did have to cross under the tarmac. I really want to give YUL a chance and not dismiss it, but I seriously have such negative experiences there. Upon boarding our second flight, I realized we were in the Plus section and that even though on the Bombardier Q400 the seat pitch is 30″ for Regular seats and just 31″ for Plus, it seemed more spacious – perhaps because of two seats per side instead of three – than on the larger Boeing 737-700 jet that has 31″-33″ for Regular and (a whopping) 36″ for Plus. The kid was tanked. It as 8:00 pm local (5:00 pm back home) and the flight didn’t have the chaotic feeling of a larger one. You could hear and feel the propeller hummed throughout and it was night outside. He fell asleep in his seat and I used my arm as a bar across him. It wasn’t uncomfortable but my phone battery power was so low due to the long day and with no outlets in flight being able to sit down and charge up at the airport, I couldn’t read an e-book. That would have been the tops, like my solo flights of yore. The lost photo/video opportunity #1 of this trip was we were taxiing on the YUL runway in a Bombardier Q400 that I was so thrilled to be on and outside the window, we pass by the Bombardier hangar and you can read the large bold font scrolling by on your window. Somewhat amazingly, the airline misplaced the carseat. Did I lose it in YUL last year as well? (Yes.) I should have told my parents to bring the one I left in their basement. They wouldn’t have set it up but it would have been better than struggling to set-up and repeatedly adjust the rubbish Cosco one Westjet provided and I thought was really sketchy. I’ve lost the car seat twice with Air Canada and this was the first time with Westjet. The perk is that Westjet would issue me a $100 travel credit if I pick up my car seat instead having it delivered. Damn straight we would. For the rest of the trip, the kid had fun enumerating the car seats that he could count as being his, and where they currently reside. (1) Graco infant seat in the possession of his aunt who is expecting another baby soon. (2) Clek car seat permanently installed in our car. (3) Evenflo gray car seat I purchased for our first travels with him, installed in his grandfather’s car. (4) Evenflo plum car seat provided by Air Canada that he’s thrown up on, residing in my parents’ basement. (5) Evenflo plum car seat provided by Air Canada that we keep in our storage and got lost this time. (6) Cosco black car seat provided by Westjet that we mean to donate to a women’s shelter in Halifax. Six! Unlike a year ago during that trip’s lost photo/video opportunity, the kid did not run towards my father. In fact, he shied away from my parents from the outset. He took to my father at home right away because they played kicking a ball. Wow, I’m going into a bit of detail and this post is slow-going. Oh well. I don’t keep a journal any longer and it’s only a five-year journal and you can’t spill your soul in those. The kid was solidly on Vancouver time waking up at nearly 11 a.m. (7 a.m.) and sleeping at nearly 2 a.m. (10 p.m.) It was raining non-stop on Saturday so we stayed in. I reasoned it was for the best and there was so much for him to play with anyhow. I would later regret missing out on a day of being out and about but seriously, it was drizzling all day long. My father found a couple of boxes of Lego and I fastidiously separated “fake Lego” out and separated any bricks still in clustered. I built a Lego house for E to play with, complete with playground with slide and parking spots. It was a fantastically vintage Lego set that belonged more to my sister than me. The kid was thrilled as he only had “baby Lego” at home. Sunday would be the only day left when my father would be able to spend an afternoon with us. After breakfast together at home we went downtown Dartmouth. Converting time zones to figure out when the kid would wake up, nap and sleep for the night I had down but then trying to slot that into the parents’ work schedule and convert back to Pacific time hurt my head at first. It sounds insane for a kid to be eating dinner at 10 p.m. local but that’s only 6 p.m. Pacific and he would only wake up from nap at like 8 p.m. and wouldn’t sleep until 2 a.m.
We first went to the OG Two If By Sea on Ochterloney but quickly turned on our heels. 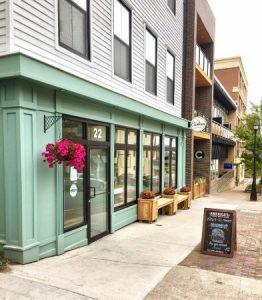 Whatever it was before – a standalone coffee shop – it is no longer and with the partnership with a pizza shop on the ground floor, it didn’t have what I presume to be the old shop’s vibe. Further, it was intensely humid in there and my parents marveled at how customers weren’t scowling and complaining up the wazoo. We took the Halifax Harbour ferry and stuck basically to a short stretch of the waterfront, wanting to make it back on the same transfer and my parents had a timeline too. The kid enjoyed a strawberry ice cream from Cows on his own, we took photos at the Canada sign and colourful Adirondack (Muskoka?) chairs. I wanted the kid to see the Harbour Hopper in action (i.e., entering or exiting the water) but instead we just saw them floating in the harbour. I hadn’t done my prep work and only while on the waterfront realized the cuteness of Hali the Train. I felt totally remiss! One of my main goals was to get the kid to learn about the noon gun but waking so close to 11 a.m made it difficult. It was infeasible again on Monday, so mum and I visit the new Canada 150 Trail, accessed after a shady looking stretch of Shannon Park. The grungy park gives way to a lovely short boardwalk with a panonoramic view of two bridges and the iconic three smoke stacks of the Tufts Cove Generation Station. I got a panoramic photo but not more as my mum kept on walking citing that that’s the only way to keep up with us and the kid ran after her and I had to chase after him to save him if he, say, slide off the trail. We hit another item on my to-do list that was to go to kid’s swim at Cole Harbour Place. I had marked the times for Parent & Tot but at 11 a.m. on the weekends and – worse – 9 a.m. on weekdays, it wasn’t happening. 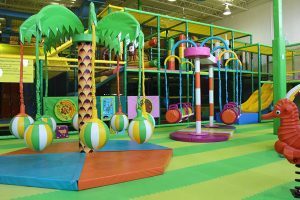 So it was $3 Splash with – the cashier estimated – 170 other kids. It was a jarring experience when I took him to the intermediate pool that got only as deep as four feet: kids shouting, splashing, water spraying, balls flying. We retreated to the tot pool where my foot scraped a pile of sand on the pool floor – what? – and it’s warm like pee … and no one stopped non-tots from coming in and splashing around. There was no entertainment in the tot pool so we were back in the other pool and I convinced the kid to sit on a giant pink kick board shaped like an octopus with cut outs at the eyes. It was the best shaped kick board compared to turtle, frog (no cut out), duck (one cut out) and boring square ones. He could then be convinced to lie down and kick and move himself around. He wanted to go down the little slide and I was impressed but when I plunked him on the pool deck, he didn’t want to walk on the rough surface when the tiled surface ended. That kid. It was a great experience. If only my mum tried to discreetly take a photo when he was on the pink octopus because he won’t be as bewildered and cute and tiny as this time again! That night we游車河 (went for a drive) the Halifax airport to get the car seat. It wouldn’t be of much note except the kid could see plenty of stars for the first time ever. And to keep everyone awake, my mum and I were heatedly debating about Taiwan. Mum is so pro-China and like personally offended Taiwan would lay some claim to being great in some way. I try to be ambivalent in general regarding Taiwan but found myself defending the island and soothing her that re-unification isn’t far off on the horizon. We made it out of the house shortly after 11 a.m. in a mad scramble and didn’t sit down to lunch together. 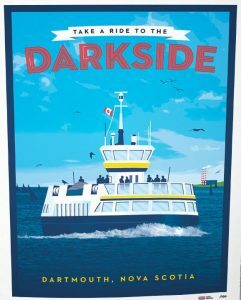 You see, I was trying to take a ride on Hali the Train (“female counterpart to Theodore”) from the Seaport Farmer’s Market/Westin pick-up spot where I figured the parking would be easier. Not really. Although the farmer’s market was non-existent, the lot was full so I got into the Westin back lot. But where’s the train stop?? We very nearly missed it. It was a fun ride, longer than the 30 minutes advertised. The kid is accustomed to the dinky mall train in Metrotown while this miniature train that will carry him on the street, outside, alongside cars and Harbour Hoppers! The tour guide had a sense of humour good enough for tourists but did he tire of it? It was also great to see the international flavour of the city as he’s from the Bahamas. He convinced me (trying to persuade the group) to visit AGNS for the Maud Lewis exhibit because her house was transported into the museum, and I never took notice of her art until that 2016 movie. My mum didn’t feel it the same way I did because she had her issues with the downtown Dartmouth restaurants, specifically the one that was my father’s employer. Sun Sun was around for 40 years downtown (I don’t know when it closed) and I grew up hanging out at their competition down the street, one called Tung Hing (now May Garden). While the character is not the same, the English name overlaps with the kid’s name, my father pointed out. 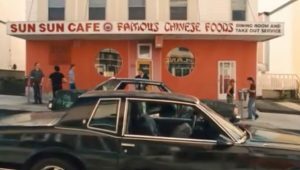 So I felt some connection being in former Sun Sun, seeing what modernization does. We walked around Portland Street just a bit as mum admired the changes. She can remember it back in a different time, but it seems super quiet to me still. I try to quell her comparisons to Yonge Street (eating street) in Toronto. We walked by Creperie and I learned that it does bubble waffle fashioned into ice cream cones – that’s progressive! Then we went to King’s Wharf where mum wanted me to see what a great view they have and I had to agree. 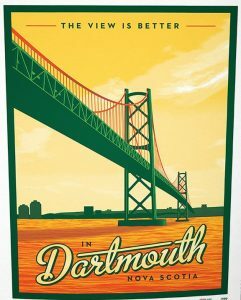 The water was positively sparkling that day and the kid and I made it partway out the King’s Wharf spit (not official name) to the Dartmouth sign. We didn’t make it all the way and if we did, I couldn’t capture it all without falling in the water. Also, the kid slowed us down as he was admanant about throwing rocks into the water – he told me his mischeivous cousin was throwing rocks in a parking lot huh – so I had to curtail the walk on the spit to watch that he didn’t slide down the bank. At two establishments during the trip, I saw the following pair of posters at establishments. It was 4:00 p.m. and the day had turn brilliant but we had to retire home so E could nap. It was another mad dash out the door to make it to Citadel Hill by 11:45 a.m. I learned that I coudln”t get into the parking lot without park visit pass. Did I mention it was pouring buckets? We also didn’t have time to tour the grounds let alone catch the cannon-firing demonstration. So I pulled over into a permit spot along the ring road. If needed, I would claim kid emergency. I slung the kid outside for about 10 minutes describing what was going on on the other side – based on a Youtube video I watched. We heard a boom seemingly out of the blue although I was providing a minute-scale countdown. I’m not sure it impressed on him so we’ll do a real tour next time. I followed the GPS to navigate from Halifax to BLIP which took me through the rotary! My sister scoffed when I long ago was afraid to drive through it but it really wasn’t that bad when my exit was rather early. I like to make a trip to Second Cup when I’m back in Halifax and what would be right across from my destination but a drive-thru Second Cup! My friend Thuy suggested meeting up at skip! hop! jump! and I was excited based on the amazing photos online. The kid had sufficient time to amp up for getting inside to play because we waited for 40 minutes waiting for friends to arrive. They hit traffic. We watched from the window and the kid was super excited when I IDed Thuy’s white minivan. He loves to associate people with the cars they drive and excitedly watched the kids spill out. Chloe is a week older than the kid. B and D are 10 and 8. We explored the toddler area first, then onto the big one. I didn’t think he would venture where the big kids were but I followed as I was allowed tow. Was I going to get stuck?? Actually, it is fun for adults, too, but don’t let that be known! Tall and wider adults than myself weren’t getting stuck. The tunnels were the worse, however. 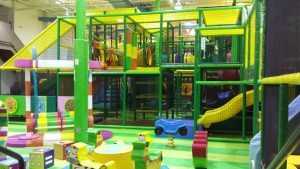 For visibility of kids throughout the structure, it was mostly nets and you wouldn’t be claustrophobic. The biggest challenge was the solid tube – the kid can turn within the tube and slide out foot first, but I was shimmying head first out of the tube. I caught up with Thuy in the middle where we could stand. Her middle child is the one good with younger kids and both were really nice to the kid who referred to them as朋友 (“friends”) and constantly looked for them to follow around. He cried his face off when we left, shortly after he had so much fun in the ball pit continuously throwing balls at B & D.
Another terrible miscalculation with regards to flight times that I shall avoid next time. We spent the wee early morning in transit to Toronto. I booked a 10:55 a.m. flight because that doesn’t sound that terrible? But I hadn’t figured the kid would be on Vancouver time and neglected that 10:55 a.m. AST = 6:55 p.m PST. And that I’d be waking him at 8:30 a.m. which is 4:30 a.m. Oh sh*t… the kid who routinely operates on under nine hours sleep was getting merely seven. I had gotten under three sleep in what I termed to NPY “Last Day in Town Insomnia” – I was up until 5:00 a.m. local! Our flight was delayed by 20 minutes, which I learned as I was getting my bags tagged and sent to the plane. That gave me and my parents an unexpected and welcome chance to sit together for a coffee and I used two of my four $10 Air Canada meal vouchers on a few beverages and a couple of food items. Lost photo/video opportunity #2: that group hug with my father and the kid. At least I have a sweet photo and video of them hugging. This was the first trip where I explored family activities and I’m so pleased that I came up spades.